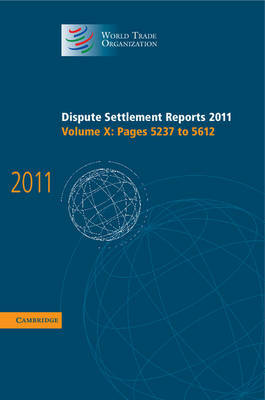 The Dispute Settlement Reports of the World Trade Organization (WTO) include Panel and Appellate Body reports, as well as arbitration awards, in disputes concerning the rights and obligations of WTO members under the provisions of the Marrakesh Agreement Establishing the World Trade Organization. These are the WTO authorized and paginated reports in English. An essential addition to the library of all practising and academic trade lawyers and needed by students worldwide taking courses in international economic or trade law. DSR 2011: X reports on United States - Use of Zeroing in Anti-Dumping Measures Involving Products from Korea (WT/DS402) and United States - Anti-Dumping Measures on Certain Shrimp from Viet Nam (WT/DS404).